"by Mark Sisson is a journey through human evolution, comparing the life and robust health of our hunter-gatherer ancestors with a day in the life of a modern family. 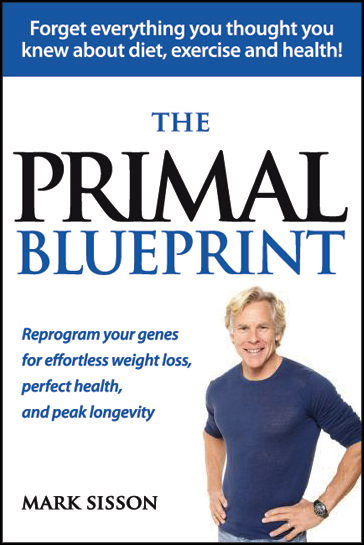 The author offers a solution in 10 empowering Blueprint Lifestyle Laws: eat lots of plants and animals, avoid poisonous things, move frequently at a slow pace, lift heavy things, sprint once in a while, get adequate sleep, play, get adequate sunlight, avoid stupid mistakes, and use your brain. The reader learns how the right high-fat diet can actually help one lose weight and how popular low-fat, grain-based diets might trigger illness, disease, and lifelong weight gain. The author presents a comprehensive, well thought out paleo style eating plan in a humorous and organized manner. He backs up all his work with research, natu"